BMW Service Engine Soon Light On? It does not mean you need an oil change. S.E.S. 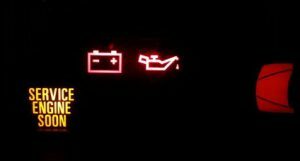 lights come on when something causes the engine to not run correctly. There is only one light so there is no way of knowing if there are multiple issues without doing diagnostics. Service engine soon lights can also be related to your transmission. Service engine soon, check engine, reduced performance and engine malfunction are all the same thing! At Meister Werks in Renton, we get this question all the time, “My service engine light just came on and I think you forgot to reset the light after my last oil change”. We wish it was that simple. This light is not a oil change reminder. This is a Check Engine light or CEL. Typically this has something to do with a sensor, emission control or even the transmission. It is difficult to tell what the issue is without a complete scan of the vehicle’s Engine Control Module or ECM. Further diagnostics may be required after this test is complete. A orange Service Engine Soon or SES light means that there is a problem with the way your car is working. It might seem to be running fine, but there is a problem. It’s nothing to be alarmed about, but you should make an appointment with us when you have free time. We will be able to scan your ECM and let you know what the problem may be. A red SES light means that there is a serious problem and you should make a appointment immediately. There could be serious damage to your car and a diagnostic is required right away. If your car does not seem to be running right or any other lights or messages are displayed on the dash, turn the car off and have the car towed in. You do not have to call, just have it towed to Meister Werks at 618 Park Ave N, Renton, WA 98057. Just one block south of the The Landing next to Boeing. For more information or to schedule your appointment, contact us at 425.254.0627 or email us.